Expanding and strengthening the global marketing support for its line of electronic display equipment, Calibre has appointed Stampede to serve as its distribution partner for the Calibre HQView range of presentation switchers, LEDView range of switcher-scalers for LED displays, and HQUltra range of scaler-switchers specially designed for rental staging—all of which incorporate Calibre’s HQUltra precision scaling and HQUltraFast input switching. Stampede will also distribute Calibre’s range of professional blend-and-warp image processors. The appointment is effective immediately, according to Calibre CEO Tim Brooksbank. “Calibre has been innovating image processing solutions for third-party OEM customers for more than 28 years,” said Stampede president and COO Kevin Kelly. “Now that the company is expanding its business strategy for sales and marketing of Calibre-branded solutions, we are honored that they have selected Stampede to serve as the one distribution partner to help them penetrate more vertical markets on a global scale. 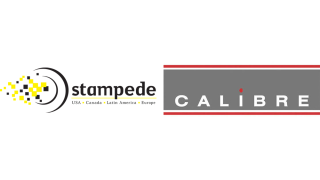 “Calibre is a perfect candidate for the new Stampede Global Distribution Program. This very solid, high-quality regional manufacturer now has the opportunity to look far beyond its traditional market focus and reach a truly global audience of buyers, quickly and cost-effectively, by working with a single source of contact: Stampede. We expect other regional manufacturers to take advantage of this strategic business-building program.